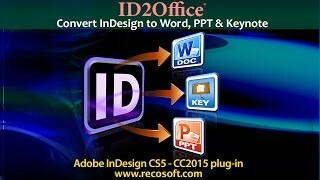 Convert InDesign to Word, Keynote or PowerPoint using ID2Office from Recosoft. 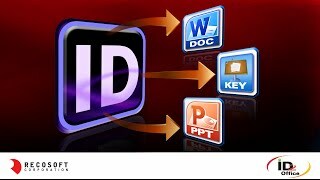 Watch how to install ID2Office against InDesign. You need to make sure that InDesign is not running, its being installed from the main Administrator account and that InDesign is installed in the computer. After that exporting an InDesign file to Word or Keynote or PowerPoint is easy. Today, we want to go over the procedure of installing ID2Office. The InDesign to Word, PowerPoint and Keynote conversion tool from Recosoft. ID2Office is a plug-in for InDesign but its important to understand that ID2Office comes packaged in a installer. I’m demonstrating this on the Mac but the steps for Windows is the same. So, here I have the ID2Office installer. Before we double click to run the installer, you need to ensure that InDesign is not running; otherwise the installer wont work. I’m going to double-click the installer and we see the welcome screen initially. Lets just click “Continue”. The “Read Me” screen appears which contains last minute information. Again, we just click “Continue”. We get to the “License Agreement” screen. You need to Read this as it clearly explains the licensing terms. For now, I’m just going to Click OK and then just click “Agree”. For the Mac, ID2Office asks you to identify the location where InDesign is installed. This is an important step otherwise ID2Office will not install correctly. We click “Choose” and navigate to the folder that contains the Adobe InDesign folder that you want to install ID2Office against. In this case we’re installing against InDesign CC and select the Adobe InDesign CC folder and choose “Open”. Once ID2Office identifies the version of InDesign it will show the location in the in the installer window. Again, click Continue and then click “install”. The installer will then proceed with the installation and you’re set. Lets launch InDesign and you’ll see the Recosoft menu and the “ID2Office – Export to Office format command”. You’re now ready to convert InDesign files to Word, PowerPoint or Keynote format. Lets just open up a simple InDesign file that’s been saved natively to the InDesign CC format and export to the Word format. I’m opening up a very simple file with some simple graphics, text and table. We now choose “ID2Office – Export to Office format” from the Recosoft menu. When the ID2Office – Options window appears, let just choose Word 2010-2013 and click Export. Now we name the file and click OK and we’re done. Just a couple of notes before. Please don’t move the ID2Office plug-in once its installed. 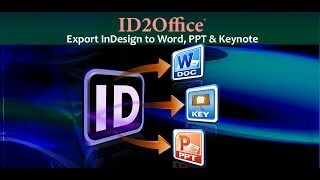 ID2Office has many parts and the installed InDesign plug-in is just one of parts. If you move the plug-in on your own, ID2Office will not operate. Also, please don’t move any other components ID2Office may have installed in particular the ID2Office folder that is installed in the “Applications” folder on the Mac or the “Recosoft – ID2Office” folder created in the “Program Files” folder for the PC.